The Chic Country Girl: DIY: How To Make & Tie A Blanket Scarf | Happy First Day Of Fall! 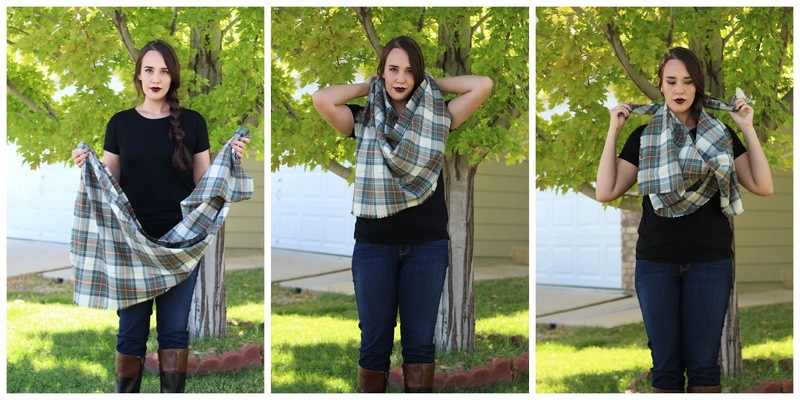 DIY: How To Make & Tie A Blanket Scarf | Happy First Day Of Fall! Today is Sep 23rd which means its officially Fall. Eek! I am so excited, I wait all year for Fall to come around. The air is finally getting crisp, the trees are beginning to transform into beautiful golden hues and Pumpkin flavored goodness is around every corner. Fashion is best in the Fall months. You can add layers of different textures and colors, and you can do this best by layering beautiful scarves over any Fall outfit. Today I thought I'd show you how to make a Blanket Scarf. It's very easy. 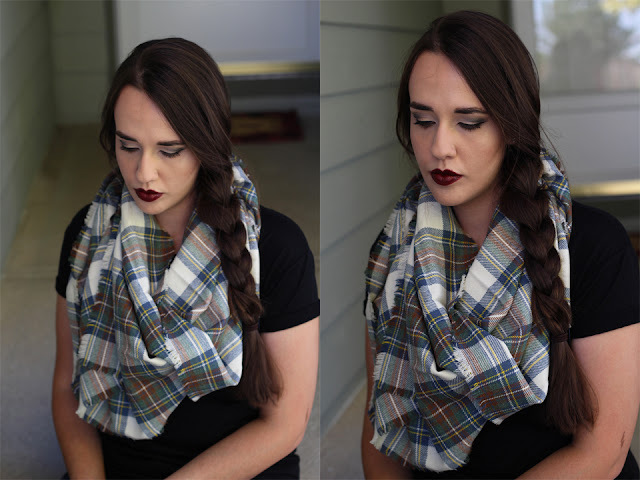 I did a post on "Blanket" scarves last Winter but wanted to re-fresh with better pictures and descriptions. Grab two opposite ends of your scarf and pull both to the back of your neck, then bring those ends around to front tucking them under your scarf. 1.Start off by measuring your fabric. For this scarf I used one yard, but normally I'd use at least 2 yards.I only had a yard of this beautiful Vintage Scottish Wool, so I used what I had. Once you've measured off at least one yard try to cut as straight as you can. 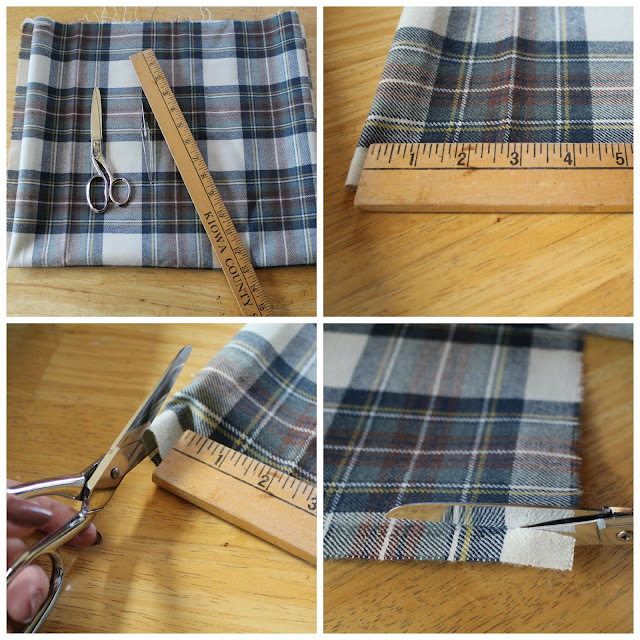 You might need to even up both ends because most fabric stores are really choppy when they cut your fabric. 2. 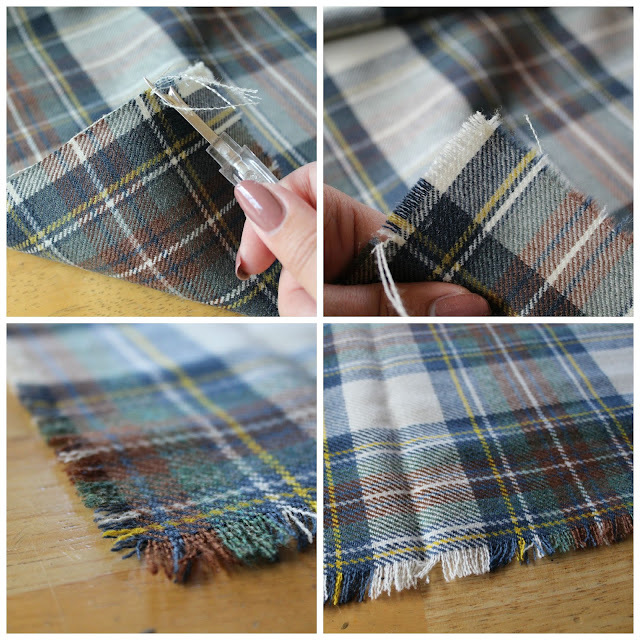 Cut both non frayed edges this way you can fringe all four sides of your scarf. Skip: This step if you only want Fringe on the two ends. 3. Take your seam ripper and begin pulling out threads. I usually start off by pulling no more than four thread rows at a time otherwise you can get really tangled and your fringe starts to look uneven and funny. Keep pulling and until you reach the first end. 4. Once you've reached that first end go onto your next side this way you'll keep your fringe looking the same on all sides. Just keep going around and pulling out threads until the fringe is at your desired length. 5. Shake out your Scarf to remove any stuck threads and your DONE! So cool. 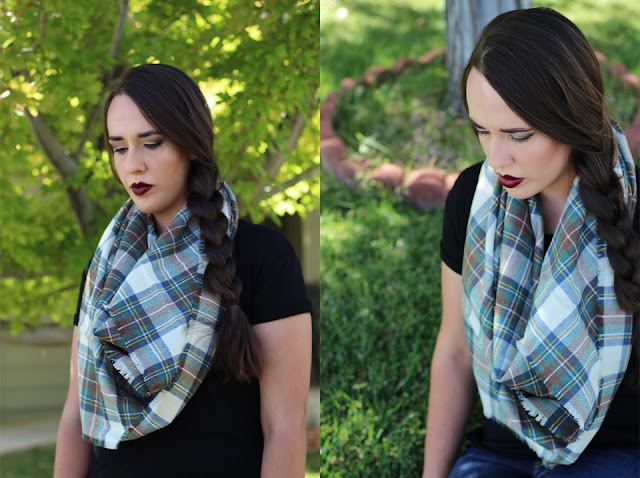 Love the Plaid color combination. Very pretty. Love this! My friend and I have been wanting to make these but thought it would be more difficult. Will the edges continue to fray or is it good? I haven't had any issues with mine. Id recommend being careful if you wash it but other than that you should be fine.